Radiesse® is an anti-aging injectable product for the face and hands. At Serrão Rejuvenation Center, Dr. John Serrão – a board certified gynecologist and post-graduate trained cosmetic surgeon specializing in facial rejuvenation – offers Radiesse® for women in Orlando, Winter Park, and the surrounding areas of Florida. Collagen has long been recognized as a key part of young skin. In young skin, collagen is lost and replaced at an equal level. As we age, our bodies produce less collagen than what is lost, and the result is wrinkles and lines. Radiesse® is an injectable product that uses a unique mechanism to stimulate collagen production. The gel contains small microspheres that rest within the layers of skin. Your body naturally builds collagen around the spheres that dissipate over time, leaving the new collagen in place. Serrão Rejuvenation Center specializes in treatments for women who want the most advanced anti-aging services available. We offer a range of surgical and non-surgical options, such as Radiesse®. Our patients love the results so much that they often refer friends, family, and co-workers to our practice. Dr. Serrão performs all our Radiesse® treatments, so he understands exactly how and where to make the injections for the best possible results. Each treatment plan is customized to the patient, so the results are far superior to what is achieved by practitioners who use the same injection sites and volume of Radiesse®. Use natural collagen production to soften lines and wrinkles with Radiesse®. 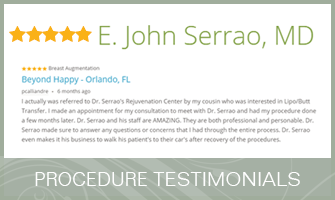 At Serrão Rejuvenation Center, Dr. John Serrão – a board certified gynecologist and post-graduate trained cosmetic surgeon specializing in facial rejuvenation – offers Radiesse® for women in Orlando, Winter Park, and the surrounding areas of Florida. To learn more, contact us to schedule a consultation and begin your rejuvenation today. Radiesse® is a unique dermal filler that is approved by the FDA and proven to stimulate the production of collagen in skin. The mechanism works thanks to microspheres of calcium hydroxylapatite. The gel and microspheres give the skin an immediate lift that may visibly reduce wrinkles, but the real results happen over the coming weeks. When the body senses the microspheres in the skin, it increases the production of collagen and lays it around the spheres. Over time, the spheres dissolve, leaving behind the collagen. The increase in collagen is why Radiesse® provides our patients with some of the longest-lasting results available with dermal fillers. Radiesse® is administered with a tiny needle at several injection sites in and around the wrinkle. What Should I Expect After My Radiesse® Treatment? You may notice minor bruising, tenderness, swelling, and bleeding at each injection site. These symptoms typically last one to three days. Serrão Rejuvenation Center structures the cost of Radiesse® based upon the amount of product that is needed, as well as the number of injections. As such, the cost varies by patient. We can provide this information during your consultation, and we invite you to learn about our financing options.